My friend saw my post yesterday about my not having a lot of inspiration, and she emailed me suggesting that I take a little trip to Fox & Obel over at North Pier. I think that's a most excellent suggestion and plan to head over there the first chance I get. It's a little off my beaten path so I don't make it there as often as I'd like. I'm also way overdue for a trip to Trader Joe's. In the meantime, I did have the urge to cook today and have been quite busy in the kitchen. The first thing I wanted to take care of was another yellow lentil recipe I wanted to try, especially because it contains tamarind paste, and I just happened to have a jar of tamarind paste I bought a while ago and had not yet had the chance to try. I've been a little squeamish about the yellow lentils since the last time I made them. It's not really their fault. The last time I ate them was the day I came down with a sudden fever that lasted 24 hours. I know it wasn't the lentils that gave me the fever, but I've been a little superstitious about eating them ever since. 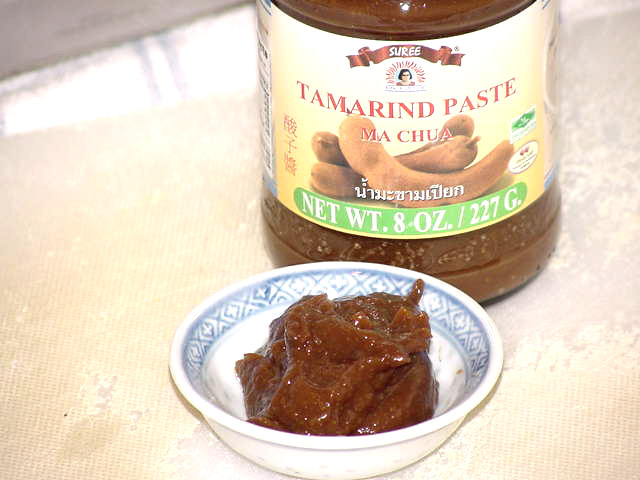 So I figured it was time to confront that irrational fear and try out the tamarind paste all at the same time. I thought I had found the only yellow lentil recipe I would ever need with the Masala Dal I made back in October, but I think this might be even better. The recipes are almost identical, but it's the differences that make this one stand out a little. This recipe calls for chilies instead of chili powder. I used serrano peppers and it was a sharper, cleaner, stronger heat than the chili powder. Whole coriander seeds are used instead of ground, and they lend occasional bursts of sweetness throughout the dish. And the tamarind adds a nice tart counterbalance. 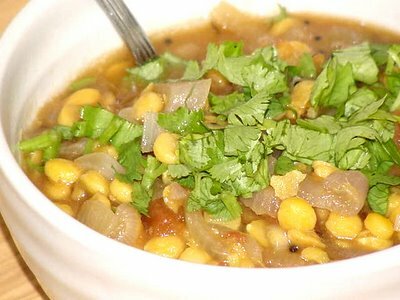 I found this recipe at Recipezaar.com when I googled "yellow lentils recipes." I haven't really spent much time there so I don't know how reliable their recipes are overall. It's ad heavy and pretty busy. I like my sites a little cleaner. This recipe came out with more liquid than the other one, and I like that better too. All in all, I think I prefer this version, even if the other one was prettier. I used a 14.5-oz. can of diced tomatoes, drained, with the liquid combined with the water for the 3 cups that cooked the lentils. I looked for information on sambar onions. Apparently, they're tiny purple shallots, smaller than the ones we get here. I used regular shallots and sliced them. The Asian market down the street let me down and did not have any fresh curry leaves, which they usually carry. I used bay leaves instead, put them in whole, and took them out before serving. This is Gayatri Venkatesh's recipe from the Thursday magazine. Its really tasty. You can tone down the spiciness by reducing the number of green chillies if you please. Enjoy! Put the lentils, tomatoes and 4 cups of water with a pinch of turmeric powder in a pot and cook until the lentils are tender. Heat 1 tablespoon of oil in a pot. Add mustard and cumin seeds. Cook until seeds begin to pop. Once they stop spluttering, add coriander seeds, asafoetida powder, curry leaves and green chillies. Stir-fry for 5 minutes. Add onions and stir-fry till they become golden brown in colour. Remove from heat and add to the lentils. Stir well. Add tamarind pulp and salt to taste. Mix well and bring to a boil. Remove from heat. Garnish with coriander leaves and serve hot over rice along with some plain yogurt on the side or with dosas and chutney. Oh man, I so want to go to Fox and Obels. Mrreall and I have decided to try and take a bit of a break from the Jewel/Dominick's hegemony and just go to other markets for a while (read: until we get lazy). This can mean anything from a trip to Caputo's, or a luxury journey to the Fox. You know, I still haven't made it to Caputo's. One of these days . . .
What Could Be Better Than Cacao Nibs?